5. Defend government spending, and your policies in particular, as having saved the economy when neither consumers, banks or businesses were spending a nickel. New data out last week showed that consumer confidence is way up, unemployment and foreclosures are down, housing is recovering and Americans are feeling the country's headed in the right direction. Pounce on that! 7. Proudly discuss the auto bailout and how you saved that critical industry...while reminding voters how Romney wanted to "Let Detroit Go Bankrupt"
12. On foreign policy, don't let Romney hang you up on Benghazi. Acknowledge the ongoing investigation to get to the bottom of what happened, assure voters that the terrorists will be brought to justice, and then remind them of how the world, because of you, is free of bin-Laden, al-Zawahiri and Qaddafi, and that al-Qaeda has been nearly decimated and that there’s been more Drone attacks into Pakistan than ever….all of which continues to keep Americans safe here at home. 13. Repeat the following catchall’s as much as you can: “Will end Medicare as we know it.” “Will privatize Social Security.” "The job creators aren't creating jobs." “Will return us to the same failed policies of George W. Bush.” “Detroit lives and bin Laden’s dead.” Huge tax cuts for the rich, increases for the middle class.” “The math simply doesn’t add up.” “Let women decide what happens to their bodies.” "Our enemies have been brought to justice." "The war in Iraq is over." "Our troops in Afghanistan will soon be home." 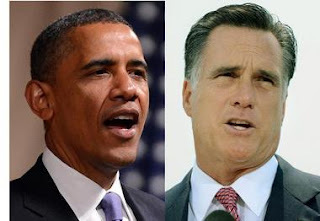 Romney's got the right lathering for him with four years of GOP-Media-Machine manifested hatred behind him. Mitt should move further to the left. Say he wants Soros as Treasury Secretary. Janet Reno for State. Say he's dumping Ryan and thinks some sort of Romney/Kennedy ticket sounds sweet, then... flick his hand, index finger pointed at the camera and "shoot" saying no more guns, no more wars, no more Bibles.... but don't worry, I'm still going to cut your taxes, I'm a Republican, and he's a shoo-in.